A Change Of Heart About Reading. What are you reading at the moment? I'm re-reading an Anna Jacobs novel that I read with great pleasure when it was published eleven years ago. Second time around, I remember the broad outline of the plot, but that isn't stopping me getting absorbed in it all over again; and it has made me think about how little re-reading I have done as an adult. As a child reader, I devoured the same books over and over and loved them just as much at each sitting. I remember reading The Hundred and One Dalmatians for the first time and when I got to the end, I turned straight back to the beginning and started again. But when I moved onto adult books, my attitude changed and I can pinpoint the exact moment this happened. 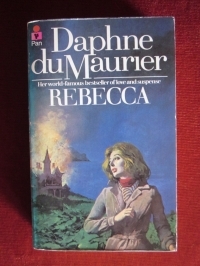 When I was 15, I read Rebecca and was completely swept away by it. I read it one summer holiday; I can remember my family sitting in deck chairs on the promenade in Llandudno (on a fine day, you couldn't move on the prom for deck chairs back then), all of us with our noses in books. I remember finishing Rebecca and thinking: I'll never read this again, because there are too many adult books to allow time for re-reading. Until now, I have always thought of myself as not being a re-reader, but the truth is that there are certain books that have sneaked into a special place in my heart, that I have re-read – more than once. I thought I'd share some of them with you. 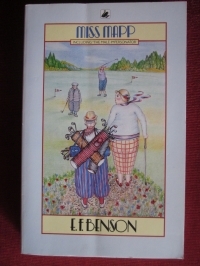 Well, to start with, there's the wonderful Miss Mapp by E.F. Benson. Who could possibly read that only once and never pick it up again? The scene where all the tins come tumbling out of the cupboard makes me laugh every time, even though I know it's going to happen. In fact, knowing it's going to happen makes me enjoy the scene all the more. 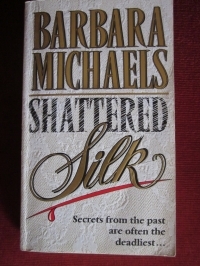 Another favourite is Shattered Silk by Barbara Michaels, who also writes as Elizabeth Peters. Shattered Silk is romantic suspense at its best. The first time I read it, my heart beat faster each time the tension cranked up a notch. You don't get that same experience on a re-reading because obviously you know who the killer is; but I still love the book, partly because of the characters, especially Karen, the main character, who develops and grows throughout the story in response to what happens to her, and partly because the shattered silk of the title refers to two things I dearly love – vintage clothing and sewing. And the whole book is laced with the Michaels/Peters trademark dash of humour. I re-read Jane Austen every so often in my never-ending quest to decide which is my favourite; and I love Wives and Daughters by Mrs Gaskell. Oh yes, and Saki's short stories, especially those featuring Clovis. I do quite a bit of re-reading through listening to talking books. I simply never grew out of wanting to be read to. While I like to try new books, I can't resist returning to old favourites. I listen to Erica James's Airs and Graces, read by Eve Matheson, every year; Hattie's Mill by Marcia Willett, read by June Barrie, likewise. I also love the early titles in Lilian Jackson Braun's Cat Who... series, which are read so beautifully by George Guidall; and more or less anything by Anna Jacobs, but especially Our Lizzie, Our Polly and Our Eva – I never can decide whether Polly or Eva my favourite Anna Jacobs book. I love listening to classics, too, especially Anthony Trollope and Wilkie Collins. I've recently embarked on The Lord of the Rings, read by Rob Inglis (a superb performance), and have just finished The Fellowship of the Ring. Hmmm... maybe I'm more of a re-reader than I thought. Starting now, I am officially renouncing my “non re-reader” status and I'm going to be revisiting lots of books in future. How about you? Do you re-read a lot? What favourites couldn't you live without? A thought provoking post, Susanna! While there is always that thought lurking in the back of one's mind, which EJ Frost mentions above - so many books, so little time - there are times when a re-read is like a soothing balm. I find if I've read a book which I found disappointing or when I'm struggling to find something to settle in to, re-reading a favourite is a comfort and re-sets the reading brain balance somehow. Does that sound weird? What I choose can vary. I've re-read Susan Howatch and Robert Goddard recently, plus an old Catherine Cookson favourite The Round Tower which I read first about 40 years ago!!! It was just as engaging as ever, too, I'm pleased to say! Thanks for your comments, Cathy and Jan. Lovely to hear from you both. I'm like you in not persevering with a book I'm not enjoying. I have to get into a book straight away. Being able to read a sample is a big help. Thanks for saying you enjoy my blog. I'm with you on the love of the physical book, Jan! The kindle is useful, as you say, but nothing beats the pleasure of holding a book. I don't generally re-read books, Sue, but now I have a Kindle I am starting to think of some books I would prefer to have in paper form as well. I love to take my Kindle on holiday or pop in my handbag for car journeys but nothing beats the feeling of being able to flick back some pages, scanning for a lovely piece of description or checking up on a character's reaction again. My husband insists you can do the same on an e-reader - he only reads on his iPad and reads all the time - but I don't agree. Years ago, I did re-read 'Five Quarters of An Orange' by Joanne Harris - I loved that book! A great post again, Sue! Having a few problems getting this to send so if it arrives twice, oops, sorry. I'm not much of a re-reader although I've read Lord of the Rings and Brideshead Revisited several times. And Rebecca more times than I can remember and watched the film too. Also, if I'm not really into a book I stop reading it. I don't persevere in the hope I will start to enjoy it more. Usually I read on my Kindle and I read the free sample and can tell if I'm going to enjoy a particular title so generally only download stuff I go on to enjoy reading. Thanks for your blog - I do enjoy reading it. P.S. Frances Hodgson Burnett - A Little Princess - read countless times since I was eight years old. Lovely to hear from you, Jen. I have read some of Kristin Hannah's books as well and loved them. She gets right inside her characters. And you're right, as writers we do learn a lot from what we read. I love your final remark - I don't know what a day without reading is like either! Like you, I was a big re-reader as a child, but not so much as an adult. However, I always return to old favourites like L.M. Montgomery, L.M. Alcott and Noel Streatfeild. As a romance writer, I also re-read. The first time through is for the story while the re-read is to learn writing craft. At present, I'm reading American women's fiction - Kristin Hannah, Elizabeth Wrenn & Jennifer Weiner. Like others who have commented, I always have at least two, maybe three books in progress at once. A day without reading is like a day without...? I don't know as I read every day! I read every day as well, Nicola, and I always have two books on the go - one that I'm reading and one that I'm listening to. If I have a third one at the same time, it is usually non-fiction. I agree with you - reading is one of life's essentials. Thanks for dropping by again. I can't go a day without reading. I must admit, I'm not and have never been into the classics and have only read them out of necessity. Apart from that, I read all sorts depending on my mood and usually have two or three books on the go at once. I like Nora Roberts, David Baldacci, Sott Mariani, Barbara Taylor Bradford, Peter James, Jeffrey Deaver and love a good ole Debbie Macomber with a large slice of chocolate cake and a pot of tea. Currently I'm reading Never Let Me Go by Kazuo Ishiguro, Lamentation by C J Sansom and Broken Dolls by James Carol. A find reading enriches my life and I am in awe of all those great writers out there doing a fab job. Thank you so much for your long and detailed comment. I appreciate your taking so much time. I agree with you about not persevering with books that don't have immediate appeal. When I was a lot younger, I felt an obligation to finish any book I had started, which seems daft now. I too love Thomas Hardy's poetry - for some reason, I never think of reading it as re-reading, possibly because I dip into it. Your comment about getting more out of a book with each re-read struck a chord with me. I find the same. It applies to listening to talking books as well. Moreover, a good reader adds to the pleasure of the story. Sometimes I choose a talking book because it is read by a favourite reader rather than because of who wrote it or what it is about. So many books, so little time . . . I think the truth of that hit me in college when I read that an "educated man" of a certain age could have read all the books then published. I checked to see how many books were in the Library of Congress, did the math, and realized that even if I read every waking hour for the rest of my life (forget working, having a family, etc. ), I still wouldn't be able to read them all before I died. That thought hit me harder than the realization of my own mortality. I resolved then to only read books that engaged me, and put down anything that didn't grab me in the first 20 pages, something I've stuck to in the years since. I do re-read my favorite books, because I get more out of them on each re-read. But my "favorite books" shelf is small (in comparison to the "to be read" shelf, which is a 6 by 6 bookcase plus several dozen titles on my Kindle). Favorites I couldn't live without include Austen and Hardy (more his poetry than his novels, and the poetry of Robert Frost, W. B. Yeats and T. S. Elliot, which I re-read frequently), but are mostly more modern: William Gibson's "Neuromancer," Frank Herbert's "The Lazarus Effect," Ursula K. Le Guin's "The Left Hand of Darkness," Stephen King's "The Stand," David Brin's "The Postman," Tanith Lee's "Death's Master," Patricia A. McKillip's "The Riddle-Master of Hed," H.P. Lovecraft's "At the Mountains of Madness," Susan Cooper's "The Dark Is Rising," Jo Clayton's "Irsud," Robin McKinley's "The Blue Sword," Patricia Wrightson's "The Dark Bright Water," Garth Nix's "Sabriel," Nancy A. Collins's "Sonya Blue," Barry Hughart's "Bridge of Birds," David Palmer's "Emergence," Madeleine L'Engle's "Wrinkle In Time," Anne McCaffrey's "The White Dragon," C.J. Sansom's "Darkfire," Kate Griffin's "The Midnight Mayor," Jim Butcher's "Turn Coat," and most recently Ben Aaronovich's "Broken Homes." I re-read most of those every year. Your idea of listening to books is wonderful and something I rarely do. I listened to Tom Hiddleston read a James Bond mystery on my iPod because I love the timbre of his voice. I've also been to several author readings and really enjoyed them. Buying a few more audio-books for my iPod might be a very worthwhile investment! I don't persist, either, with a book that doesn't grab me, Carol. When I was a lot younger, I used to feel that if I started a book I had to finish it, but I haven't felt that way for many years! Thanks for your comments. A writer called Tobias Hill..I read and re read.... and a couple of crime writers. As I have very little time for fiction (I write Victorian crime fiction, so my reading tends to be historicl) I am fussy about what I like. Will try a recommendation...but won't persist if it doesn't ''grab'' me. Sigh. Getting worse as I get older.